Feature and Follow Friday is a weekly meme/feature hosted by Alison Can Read & Parajunkee. Bookshelf tour. Give us a tour of your bookshelf. 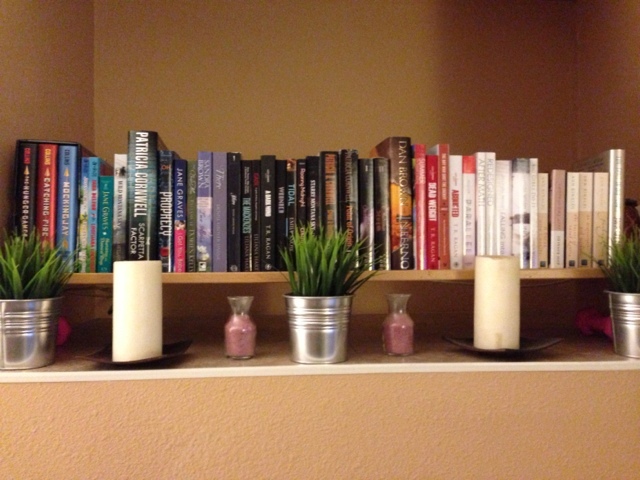 This is my bookshelf in my living room. My sister recently organized it for me and color coded the books. These were in boxes before she set this up. This is the book shelf in my spare bedroom. As you can see, I am a huge Sandra Brown and Patricia Cornwell fan. I used to have all of the Harry Potter books but I gave them to my husband's little sister since she really wanted them. I need to restock them on my shelves. I've only read a few of Patricia Cornwell's books but I did like them. Nice to see another lover of Mystery novels. I haven't read many of them lately but I'm also a fan of the genre. Haha! I love the organization! I used to have mine alphabetized, but now I have this thing where I go from the size of the book. Thanks! If you like murder/mystery, her books are great and the Scarpetta series is one of my all time favorites. I love her older books. The newer ones aren't as exciting but I do still love the series. 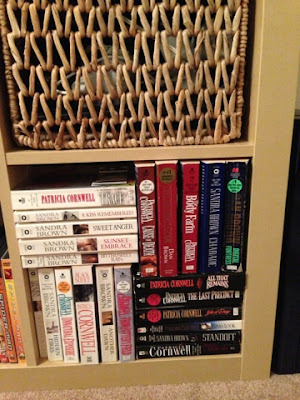 I love Sandra, she writes the most amazing Thriller/romances. I do like the older Scarpetta books better but I am a fan of the whole series.